From Stow, OH to Marietta. OH, the 200-mile challenge is easily one of the best ultra tour rides in the Buckeye State. The 200-mile Challenge is composed of roads in very good condition, with light traffic, nice sweeping climbs and some technical twisty turns and switchbacks. You may even pass the occasional Amish Buggy on your journey south. Your last 100 miles are just awesome: on new blacktop, with a high concentration of tight turns, and very significant elevation changes. Monroe County's hills and valleys are so spectacular that it's called the Little Switzerland of Ohio. 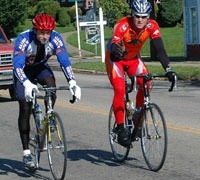 The ride finishes with a 30-mile stretch along the Ohio River to Marietta. likely Pennsylvania’s Black Forest is really a combination of both these derivations. The mountain bike choice is yours, either a 26 or 29er is acceptable, though on many of the routes you could theoretically get by with a cross bike - which is considerably more dangerous on the gravel and dirt road descents. With a 26 mountain bike, you’re ok with a hardtail, but would be much more comfortable if you have some sort of shock seat post on board. I use a 29'er hardtail mountain bike, so those big tires really take the bite off of rough roads, rocky descents and rooty single track, though I definitely loose some power in my climbing with the front shock on. When it comes down to a trade-off between comfort and power, I’ll take the comfort on a 5-8 hour ride any day! Forget about hybrids and road bikes up on the Black Forest fire roads - save those bikes for riding on the flats on the Pine Creek Bike & Hike trail or the asphalt roads. HISTORY - in 1994, I successfully embarked on a solo, one-day double century (200 mile) bike ride from Hudson to Marietta Ohio. 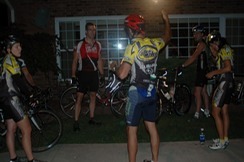 I finished in a Captain D's parking lot in downtown Marietta, in the dark at 9:30 PM - riding the last half mile in circles. In 05' I was talked into a second attempt of the 200, which we successfully completed. In 06' myself and Pete Baughman successfully completed the third traverse. Since 2006 over 32 different riders have completed the full 200 miles - and several have done this challenging journey numerous times. WHEN - To be anounced in Summer 2017. There will be a rain date one week later if needed. 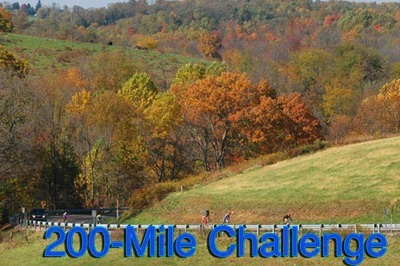 Please join us for the 10th 200-Mile Challenge. FITNESS LEVEL - for the 200-mile “challenge”, you need to have a very solid base of riding in your legs, including several 100-mile + rides to your credit that you have done in under 6 hours. FULLY SUPPORTED – chase vehicle, unlimited liquid refills, food stops, chase vehicle will carry each riders special needs bag. Max limit of 7 riders for this trip. TIME - the 200-mile ride will start promptly at 5:30 am, and continue until 7:30 pm. No riders will be permitted to ride past the 7:00 pm cut-off time. THE ROUTE - will take riders from Stow, into Ravenna, and then south to Dover-New Philadelphia. From the Dover-New Philly area, we will continue south along scenic Rt. 800 and into Ohio’s “Little Switzerland”. Here you’ll be riding over some of the largest, and most stately hill climbs in the state, and be treated to some spectacular scenery as you cycle across ridge tops, and down into valleys and hollows. After descending down to the town of Fly, on the Ohio River, you will continue southwest along the Ohio River on Rt. 2 to Marietta. COST - $100.00/rider. You will have support vehicles, food, beverages and carbo supplements provided during the ride. After-event dinner/snack on the way home is on you. We will return that evening to the Akron area. My van can hold 7 riders (I'll be using my trailer to haul the bikes), so please make arrangements with me if you plan on coming back on your own with alternative transportation. was scoured into the landscape by the flow of Pine Creek over the past 350 million years. 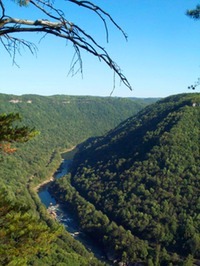 Now surrounded by nearly a million acres of Pennsylvania state forest and parkland, the Pine Creek Gorge plummets 427 meters from the rim to its deepest point, exposing rock from the Paleozoic. The sandstone, siltstone, mudstone and shale that form the valley can be seen on our numerous mountain bike rides where we ride to the bottom of the gorge. The alternating, gently inclined layers of rock display brilliant shades of gray, red, brown and green. Unlike Arizona’s Grand Canyon, however, Pine Creek Gorge is quite wet. In the summer its numerous waterfalls cascade down sheer bedrock cliffs, plunging into small pools, runs and streams that flow into Pine Creek at the bottom of the chasm. Along the canyon's rim, a hard sandstone layer supports precipitous cliffs that reach out over the gorge - and invite the adventurous to take an exciting, high-altitude view. 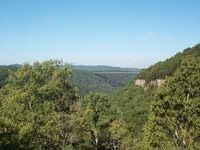 The areas two state parks have overlooks at the north end of the gorge with some spectacular vistas. Other sights include dramatic rock outcrops, scenic mountain streams, and wildlife that includes eagles, osprey, coyote, deer, wild turkeys, herons, hawks, and even river otters! The dense hardwood and pine forest, called the "Black Forest" by early settlers, towers above the canyon and forms a carpet of green as far as the eye can see. This is truly a mountain biker's paradise - heck I wrote the book on it! 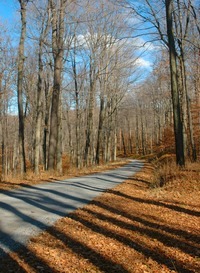 The area contains some of the most extensive, remote and scenic stretches of jeep track and fire trail in Pennsylvania. Come enjoy this most beautiful and scenic canyon with us. Our off-road mountain biking rides take you into the backcountry via state fire and logging roads, with a host of stream crossings along the way. You will see pristine vistas, creeks, gorgeous mountain views & possibly get a glimpse of a bear, deer, coyote or bald eagle, just to name a few. The opportunities for sightseeing are plentiful, so bring your camera! 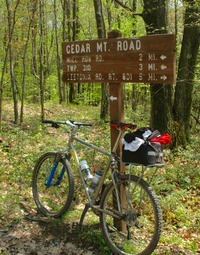 From mild to wild we will provide you with a custom mountain bike trip to remember. We're offering two Black Forest excursions: the first is for novice to mid-level mt. bikers, and the second trip is for expert level mt. bikers. Thus, daily trip distances and difficulty levels will parallel the group's ability level. You can also do portions of the trip by riding in our support vehicle through some of the tougher sections of the mountain tracks. I do want to make clear: These rides ARE NOT on single track; they are on one-lane/dbl track gravel fire roads. WHEN - Dates and times TBA for the novice-level group. WHEN - Dates and times TBA for the expert-level group. Please join us for our seventh annual Black Forest Mountain Bike Adventure. We will car caravan, leaving LifeCenter Plus in Hudson at 10:00 AM on a Friday. If you'd prefer you can leave on your own at a time of your own convenience. The drive to Cedar Run, Pennsylvania takes 4.5 hrs. We will leave on a Sunday in late morning or mid afternoon based on the weather and the group's interest in staying a bit longer. GROUP SIZE - Limited to 6 riders. FITNESS LEVEL - You will need a good to moderate base of cycling in by trip date, having been able to ride for stretches of 3-5 hrs on your mountain bike up and down hills and/or mountains. DISTANCE - The Black Forest Mountain Bike Adventure will consist of 1-2 rides per day on Friday, Saturday and Sunday. Distances will vary and are up to the riders as to how far and long they would like to ride on each segment. ROUTE - Will take riders up and over the mountains of Pennsylvania's world famous Black Forest region. Several climbs are easily 1 hr in length, while some of the other climbs are gentle rollers or steeply pitched power climbs that entail out of the saddle climbing. There are also many long, lazy flats that wind through the densely forested mountain tops and along streams and runs. Many of these fire and logging roads wind along and around the Pine Creek drainage - The Little Grand Canyon of Pennsylvania. .
SUPPORT – You will have full support from my van at several meet-up points where we will supply liquids, lunch and snacks. ROUTE MAP – We will be on Routes outlined in my book: “BlackForest Mountain Biking” which you can purchase on site. COST - $225.00/person or $375/couple. You will be provided with a support vehicle; camp dinners on Friday and Saturday evenings; Saturday and Sunday breakfasts; lunch, beverages and carbo supplements during the ride; tent (tents provided as part of cost) and camping fees. We will be staying in a campground with full shower and restroom facilities available for your convience. rock! We will make sure you’re safe and your equipment and ropes are properly rigged, and then the exhilaration of rock climbing begins! 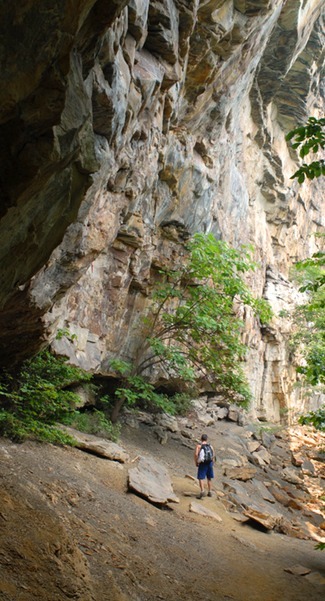 The New River Gorge contains over 1,600 climbing routes, and the cliffs at the Gorge are made up a a very hard sandstone, and range from 30 to 120 feet in height. The rock is very featured, and an abundance of crack and face routes are available. We will spend Saturday at two very different and scenic climbing venues. On Sunday we'll do a fabulous day hike, exploring the gorge's amazing Endless Wall, a massive cliff-face that parallels the New River for over ten miles. Some of the faces reach nearly two hundred feet in height. Within the hike we'll move from the base of this long precipice up onto the canyon rim where the views are just extraordinary. Our lunch break is atop a virtual "diving board" that juts out high above the gorge. Our New River rock climbing/hiking weekend is designed to meet the needs of an ever expanding populous of active people who want to experience a great dose of backcountry excitement and adventure within the span of a 2-day weekend. WHEN - Date TBA for 2017. This is a 4.5-hour trip from Akron to the New River Gorge. We'll spend Friday afternoon, all Saturday and most of Sunday at the Gorge. We'll car caravan from LifeCenter Plus in Hudson to the gorge at 6 AM on Friday, and subsequently depart from the gorge late Sunday afternoon. If you'd prefer you can leave on your own at a time of your own convenience both to and from the New. COST - $200.00/person or $300.00/couple. This includes all the necessary climbing and hiking gear you'll need, guiding service, a tent, one camp breakfast and dinner, camping fees, and snacks and lunches during our climbing and hiking excursions. One breakfast at the famous Cathedral Cafe, and one dinner at the "New's" popular eatery - Pies & Pints - is on you. Trip Itinerary - We will be tent camping, and have a group campsite at a campground with full shower and restroom facilities available for your convience. Friday eve you'll enjoy a backwoods campfire, complete with a campfire cooked dinner and refreshments. Saturday morning you will start the day with a trip to the Cathedral Cafe for its famous breakfast offerings. Saturday late morning and early afternoon we'll spend the day climbing at the awe-inspiring Endless Wall. Saturday eve we're off to Pies & Pints - a delicious gourmet pizza and microbrew establishment. Then it's back to the campground for a late evening campfire. Sunday we'll do a 10-mile long hike at both the top and bottom of Endless Wall's sandstone escarpment. Late Sunday afternoon we'll leave for Akron. Group Size - limited to 6 participants. Area Details: The pine creek Rail-Trail was voted as one of the 10 Great Places to Take a Bike Tour in the 2001 issue of USA Today. This scenic region of North Central Pennsylvania was included in that Top Ten with such great bicycling destinations as Iceland, Ireland, Puerto Rico, Nova Scotia and Italy. 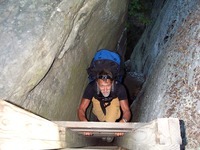 The trail follows Pine Creek through PA’s Little Grand Canyon, and the surrounding wilderness region is one of the last and most extensive wilderness areas between New York and Chicago. 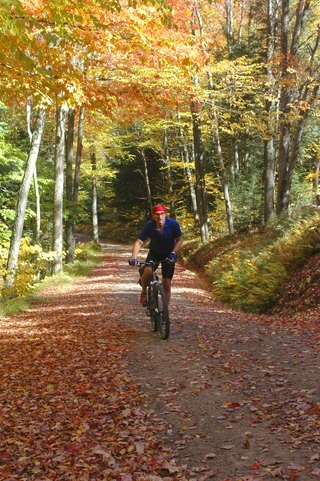 This rail trail is approximately 70 miles in length, one-way, and it winds its way through a breathtaking landscape. Along the trail are areas of moderate white water, quiet stretches of creek, towering palisades, dramatic rock outcrops, evergreen forest and cathedral sized hardwoods. You’ll also find quiet hamlets and quaint villages along the way that evoke images of yesteryear. Fitness Level: This trip is intended for the casual to beginner cyclist. Nonetheless, you will still need a base level of fitness by trip date, and be able to ride for stretches of 2-4 hrs on your bike. All of the cycling will be on a flat, limestone bike & hike trail. Trip Itinerary: You can drive on your own or travel in an 8-passenger van, leaving from LifeCenter Plus at 6 AM Friday morning and arriving in Slate Run, Pennsylvania at 10:30 AM. We’ll do a moderate ride on Friday afternoon, a full day’s ride on Saturday and a moderate ride on Sunday. The pace of cycling will be slow enough so as to allow for plenty of time along Pine Creek for photo, lunch and snack stops. Friday and Saturday evenings will be spent at the cozy Hotel Manor in Slate Run, where you’ll be treated to wonderful dinners prepared by Chef Mark. Sunday afternoon we’ll return back to LCP. Trip Cost: $325 per person or $500/couple. Cost includes: 2 nights at the Hotel Manor, 2 dinners and 2 continental breakfasts at the Manor, guiding services, plus our provided lunch & snacks during your cycling outings. Not included is: bicycle, alcohol, gratuities, and any ancillary personal and/or food items to, from and during your stay at Slate Run. Area Details: Located primarily in Lycoming County Pennsylvania, the Black Forest Trail is a 42-mile loop that starts and finishes within an old pine plantation. In between is some of the most spectacular scenery in Pennsylvania. You’ll travel through a diverse forest of pine, oak, and chestnut, with numerous spectacular accents and descents that take you high up to the mountain tops, and then down low into the many runs and hollows. The Black Forest Trail is a difficult trail to do as a fully self-sufficient backpacking trip, BUT on this trip we’ll day-hike several of the more notable sections of this famous trail where we’ll have plenty of time to smell the roses and savor the sights. You’ll be provided with van support along the way, so if at any time you choose take a break from hiking you can continue to see the region while sitting on a comfortable seat in your support vehicle. Fitness Level: This trip requires a fair-moderate level of fitness and is intended for casual to regular day hikers. We will day hike for 3-5 hrs/day with only a light day pack, and our hiking will entail flat mountaintop areas and ups and downs over hills and/or mountains. Trip Itinerary: You can drive on your own or travel in an 8-passenger van, leaving from LifeCenter Plus at 6 AM Friday morning and arriving in Slate Run, Pennsylvania at 10:30 AM. We’ll do a short-moderate hike on Friday afternoon, a longer day hike on Saturday, and a short-moderate hike Sunday morning/afternoon. The pace of our hiking will be slow enough so as to allow for plenty of time photo, lunch and snack stops. Friday and Saturday evenings will be spent at the Hotel Manor in Slate Run, where you’ll be treated to wonderful dinners prepared by Chef Mark. Sunday afternoon we’ll return back to LCP. Trip Cost: $325/person or $500/couple. Cost includes: 2 nights at the Hotel Manor, 2 dinners and 2 breakfasts at the Manor, guiding services, plus our provided lunch & snacks during your hiking outings. Not included is: alcohol, gratuities, and any ancillary personal and/or food items to, from and during your stay at Slate Run. Area Details: Located primarily in Lycoming County Pennsylvania, the Black Forest Trail is a loop that starts and finishes within an old pine plantation. In between is some of the most spectacular scenery in PA. You’ll travel through a diverse forest of pine, oak and chestnut, with numerous stunning vantage points scattered along the rugged ridge tops. This is a “must do” trip for those of you who are avid backpackers. The BFT itself is a very difficult trail, with many of the accents and descents devoid of switchbacks. Instead, these sections of trail run straight up or down the mountainsides. With that being said, please keep that in mind when considering this trip. Fitness Level: This is very Strenuous Level trip. You must be in very good physical condition with several years of backpacking experience under your belt. Trail mileage will be 10+ miles/day, and the going could be quite difficult due to prolonged mountain accents, descents, and stream crossings. Trip Itinerary: You’ll leave LifeCenter early Thursday morning for the 4.5 hour drive to the trailhead in Slate Run, Pennsylvania. From there we’ll spend 3 nights and 4 days in the backcountry while hiking the 42-mile Black Forest loop. Our campsites will range from quiet little creekside sites that are tucked deep down in the mountain’s valleys, to wonderful ridge-top sites with amazing vistas. We’ll return to Hudson late Sunday afternoon. Trip Cost: $200/person—Includes transportation; guiding services; campground fees; breakfasts, lunches & dinners for each day of the trip. Not included: Food while driving to and from Slate Run, gratuities, tents, sleeping bags, mattresses and backpacks. Tents, sleeping bags and backcountry items can be rented for a nominal fee. Tents, sleeping bags and sleeping mattress can be rented for $10.00 each per night if you do not possess them. 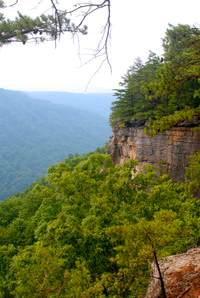 Area Details: Beautiful Otter Creek is one of West Virginia’s more remote backpacking destinations. It includes riverscapes, dramatic ridges, and high altitude bogs. 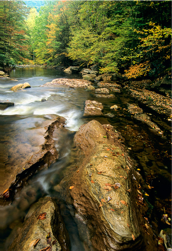 The heart of this spectacular wilderness is the 11-mile stretch of Otter Creek. A wonderful trail follows the creek, dropping some 1200 feet over numerous waterfalls and cascades as it flows turbulently through mazes of boulders on its way to the Dry Fork of the Cheat River. Some of the mountain ridges that parallel this creek are as high as 3800 feet, and help to form a basin that is roughly four miles wide. Fitness Level: This is an Easy-Moderate Level trip where participants should at least be involved in a regular fitness/training program, but posses minimal backpacking experience. Trail mileage will be up to 4-5 miles with full pack to our base camp. Your day hiking will be anywhere from 7-10 miles trips WITHOUT full pack. These day hikes can involve moderately steep accents and descents. Trip Itinerary: You’ll leave LifeCenter early Friday morning for the 5 hour drive to Otter Creek. We’ll spend 2 nights and 3 days in the backcountry. Friday afternoon we will hike to a fabulous campsite just a few meters shy of banks of Otter Creek. This will be our “base camp” for the next two and a half days. From our creekside base camp we’ll be able to go light for several day hikes within the wilderness area. The remainder of Friday you’ll have a choice of either relaxing creekside for the rest of the afternoon, or participating in a short day hike along the banks of Otter Creek. Saturday we will do a longer day hike from our base camp to a stunning lunch site situated high on a bluff far above the Otter Creek watershed. Sunday is an optional day, where you can day hike or simply relax at the campsite to read and enjoy a few hours of solitude. The second half of Sunday we’ll pack up and hike back to our vehicle for the trip back to Hudson. Trip Cost: $200/person—Includes transportation; guiding services; campground fees; breakfasts, lunches & dinners for each day of the trip. Not included: Food while driving to and from Otter Creek, gratuities, tents, sleeping bags, mattresses and backpacks. Tents, sleeping bags and mattress can be rented for $10.00 each per night.